In your ongoing efforts to modernize your company’s data protection infrastructure, you’re researching options that will provide the agility, vendor support, and scalability your systems require. But traditionally, those capabilities were only part-and-parcel with the cloud. However, Commvault has introduced a platform with which you can reap the benefits of those cloud-like services on-premises. 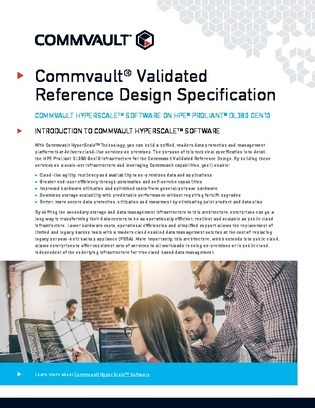 In light of this, the following document covers the validated design components of the Commvault HyperScale architecture, a unified data protection platform that can delivers those cloud-like features on-premises. The platform’s configurations were tested with HPE ProLiant DL380 Gen 10 infrastructure, and core components and features can be found by reading on.